i am all about quick + easy recipes, so i've been searching around for some good ones to add to our recipe binder. i found this recipe HERE, and you guys, this casserole is so good! it's not the healthiest dinner, but it is way better than eating out! plus, it's an easy way to sneak veggies into dinner if you have picky kids (or a picky spouse)! casseroles are my jam because you just dump a bunch of stuff into a dish and stick into the oven. it takes less time to prepare, and then you only have 1 dish to clean afterwards! every dish should be a casserole, really! 1) combine stuffing mix & melted butter in a large bowl. set aside 1/2 cup for the topping. 2) add zucchini, chicken, soup, and sour cream to the remaining stuffing and mix together. 5) bake on 350 for 45 minutes or until golden brown & enjoy! This actually does look like something we would enjoy! I agree that cooking at home is better than eating out :) We're actually trying out a MONTH of meal planning (!!!) this month. It's been going well so far. I need to save this for next month's repertoire list! This looks like a great casserole! I'd like it as is, and L could add as much hot sauce as he wanted after it finished. it is so delicious! haha sounds just like my husband!! This looks delicious! 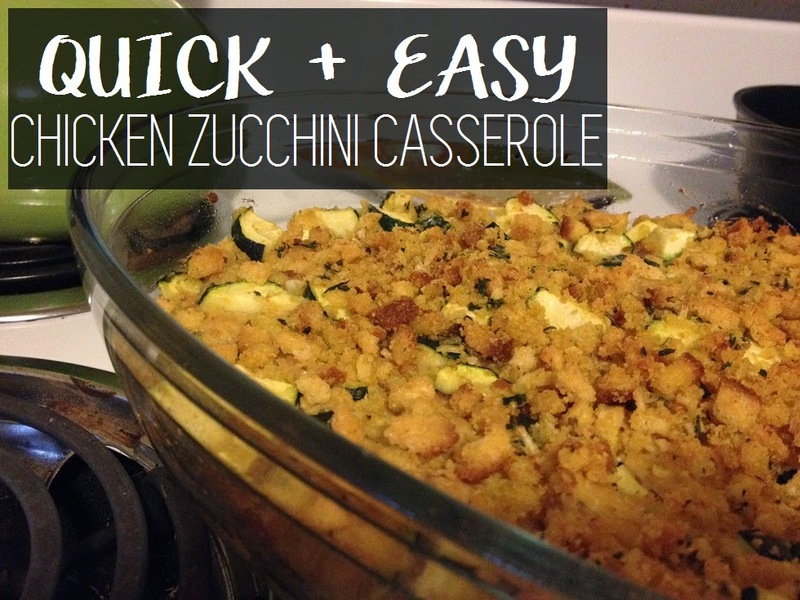 I love zucchini and buy it every time I go grocery shopping! Thanks for sharing this. Its on the menu for this week! it was super good! let me know how you like it Tabitha! i hope you love it! !